Kayhan Mortezavi is a Toronto based film director and production designer. His work has been honoured, nominated and won awards at international film festivals in Germany, Korea, Argentina, Canada and Iran. Kayhan is the creative director of Falling Chair Productions in Toronto, and his recent credits as a director include two documentaries: The Garden of Earthly Delights (Persian Coffeehouse Painting), 2013 and Adagio for Being, 2014, both of which are produced in Toronto. Kayhan was also the production designer of the feature film, Golden Cage, shot in Los Angeles in 2011, and more than 20 feature films in Iran. 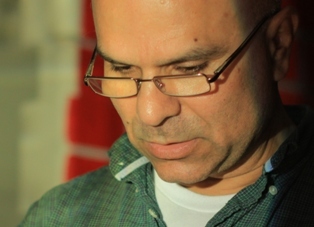 In addition to his film experience, Kayhan has worked as an art director with CBC-ROB TV in Canada, as well as numerous on TV series in Iran such as Amir Kabir, Shah Shekar, Satar Khan, and The Fall of Sahra. He has also worked as the production designer in many theatrical productions in Toronto. Kayhan holds a Masters in Fine Arts from the University of Tehran and a Masters of Education from York University in Toronto. In addition to his independent pursuits, Kayhan is a lead teacher and a specialist multiple intelligences trainer on the TDSB-MI Lead Program, working to train teachers at the Toronto District School Board. He also collaborates with the TDSB-Arts Leadership Council and the Faculty of Education at York University as a mentor.